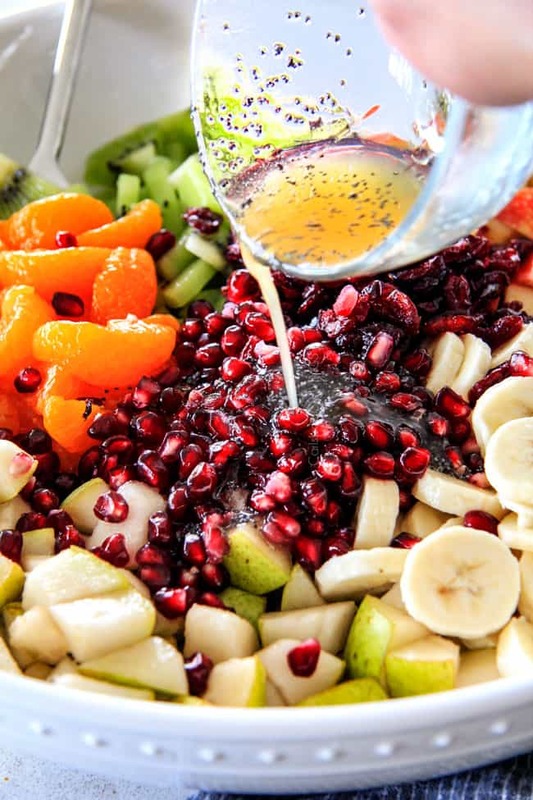 Winter Fruit Salad is simple to make but irresistibly delicious! This Winter Fruit Salad is easy enough for breakfast or brunch but tastes gourmet enough for Thanksgiving and Christmas! It is bursting with a rainbow of seasonal fresh fruit all drizzled with simple yet tantalizing Honey Lime Poppy Seed Dressing. Are you guys ready for Thanksgiving?! 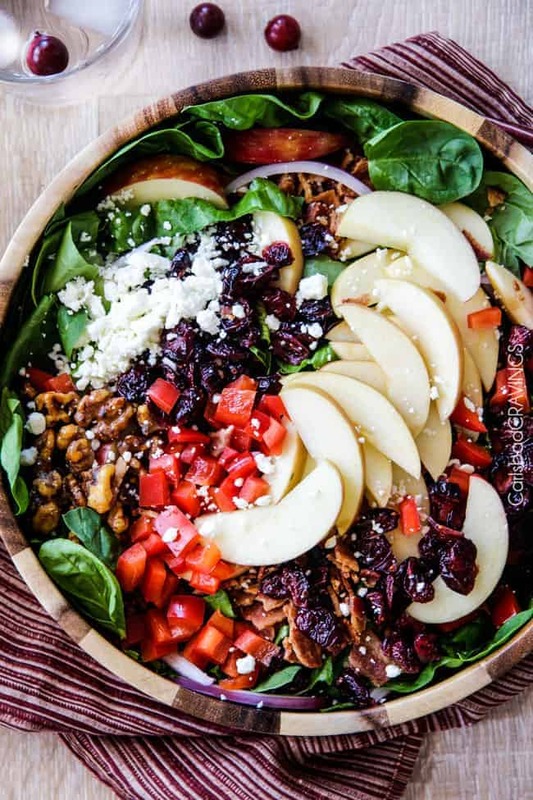 If you need some last minute easy sides, look no further than this Winter Fruit Salad or my Company Mashed Potatoes and Apple Pecan Wild Rice Pilaf! This Winter Fruit Salad can be prepped in minutes, made in advance and you can use your favorite fruits or whatever you have on hand. YAY for stress free serving and/or entertaining! This Winter Fruit Salad is an essential potluck side in my book that not only is beautiful but always disappears in minutes. The medley of fruit is stand-alone-delectable and further delishified with the bright sweet and tangy Honey Lime Poppy Seed Vinaigrette. 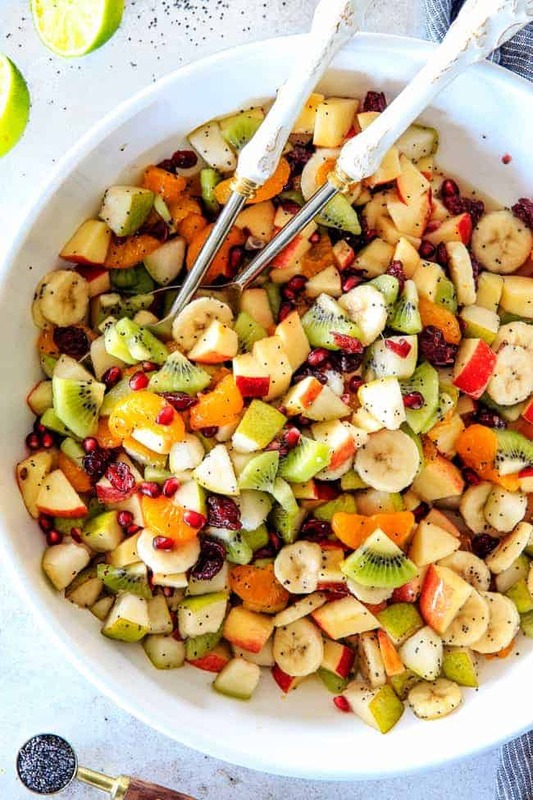 This Winter Fruit Salad is not only fabulous for special occasions, it is a fresh, nutritious and vibrant, addicting way to gobble up fruit for breakfast, as a side or a healthy snack. I love keeping this Winter Fruit Salad in my refrigerator. You do the chopping work once and get days of refreshing satisfaction. You can devour the fruit salad as is for snacks or for breakfast, I like to mix it with vanilla yogurt, granola, nuts or coconut. What Fruit is in Winter Fruit Salad? apples: You don’t need to worry about your apples and pears turning brown within the first few hours because the Honey Lime Vinaigrette contains lime in it which will keep them from browning. pears: Use ripe pears but not soft pears. bananas: Slice your bananas at least 1/2 inch thick so they hold their shape in the Winter Fruit Salad. The bananas will keep for a few hours without turning brown if they are immediately tossed in a little of the dressing which contains lime juice. You can also slice bananas into a bowl containing pineapple juice or orange juice. I don’t recommend lime (separate from the dressing) or lemon juice is it adds additional tartness). Gently stir the bananas to coat all sides then remove them with a slotted spoon and add to the salad just before serving. kiwis: take care your kiwis are ripe or else they will taste bitter. It is better to omit bitter kiwis than include them. pomegranate arils: You can purchase a whole pomegranate and remove the seeds yourself or you can purchase ready-to-eat seeds for convenience. dried cranberries: I think these are a must for the Winter Fruit Salad! They add delightful bursts of concentrated sweetness. mandarin oranges: I recommend fresh mandarin oranges as opposed to canned because canned oranges easily fall apart. If you want to use canned oranges, then take care to refrigerate the can first so the oranges are nice and chilled. For fresh Mandarin oranges, look for clementines because they are seedless and super easy to peel. I chose these winter fruits because they are all readily available in the winter months. They create a symphony of flavors and textures together that are taste bud magic in my opinion. If you don’t like any of the aforementioned fruits, are allergic, or simply want to use what you have on hand, then to free to swap some of them out. This Winter Fruit Salad is very simple to make. Chop your apples, pears, bananas, kiwis and add to a bowl along with your pomegranate seeds, dried cranberries and mandarin oranges. To make the dressing, whisk together honey, lime, poppy seeds and olive oil. Drizzle the honey lime vinaigrette all over the fruit and gently toss to combine. Best if served immediately or within 2 hours. Here are a couple tips and tricks followed by questions and answers you might have about how to make perfect fruit salad. Chill your fruit. Place your fruit– chopped or whole – in the refrigerator for at least 2 hours. Chilled fruit is everything in a fruit salad. You don’t need to chop your fruit 2 hours in advance, but at least place your whole fruit in the refrigerator because no one likes luke-warm fruit salad! Use ripe, but not too ripe fruit. We want fruit but don’t want it too ripe or it will get mush and fall apart – especially the bananas and kiwis. Mix up Fruit. Feel free tot mix up the fruit and omit/add whatever works for you! Customize Dressing. Depending on how your sweet/ripe your fruit is you may want more or less honey or lime in your dressing. Scale Up or Down. This Winter Fruit Salad makes enough to feed a family of fruit lovers or for a Thanksgiving side, but is also easy to scale down. You’ll want to divide the ingredients in half if you expect leftovers because it doesn’t keep well, particularly the bananas. Serve within 2 hours. I think this Winter Fruit Salad is best within 2 hours but will still taste delicious if served later than that. Storing. I would remove the bananas from any leftover fruit salad before storing in the refrigerator. The remaining fruit will taste delicious the next day but the pears and apples will turn slightly brown sound the edges. Leftovers. Whenever I can’t use fruit in time, I freeze it later for smoothies. For this Winter Fruit Salad, divide any leftovers into individual sandwich bags, seal and freeze for later. Combine with vanilla yogurt, ice/or frozen banana, orange juice and sugar to taste. When it comes to this Winter Fruit Salad, however, I don’t expect you’ll have leftovers. 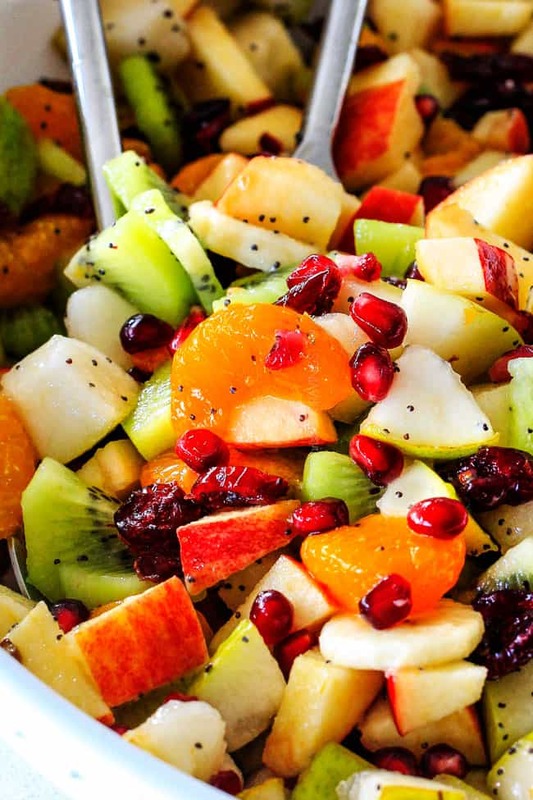 Want to try this Winter Fruit Salad? 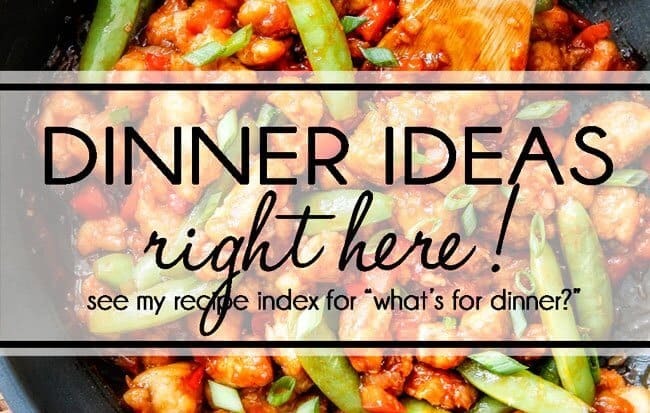 Pin it to your SALAD, SIDE or HOLIDAY Board to SAVE for later! Irresistibly delicious, fresh and vibrant Winter Fruit Salad with Honey Lime Poppy Seed Vinaigrette is simple to whip together but can’t stop eating delicious! 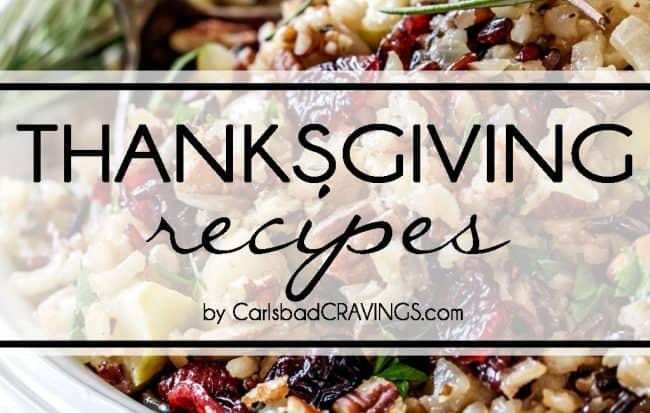 It makes the perfect Thanksgiving or Christmas side! In a separate small bowl, whisk together all of the Vinaigrette ingredients. Pour Vinaigrette over dressing and gently toss to coat. Serve immediately. apples and pears: You don’t need to worry about your apples and pears turning brown within the first few hours because the Honey Lime Vinaigrette contains lime in it which will keep them from browning. use ripe, but not too ripe fruit. We want fruit but don't want it too ripe or it will get mush and fall apart - especially the bananas and kiwis. scale up or down. This Winter Fruit Salad makes enough to feed a family of fruit lovers or for a Thanksgiving side, but is also easy to scale down. You'll want to divide the ingredients in half if you expect leftovers because it doesn't keep well, particularly the bananas. I bookmarked this when posted but just made it. I changed up the fruits (dropping the pears and bananas and replacing them with canned grapefruit and diced pineapples). It was a very nice side at dinner and has made a delicious breakfast thereafter. As the name suggests, a winter-friendly salad. Feel free to adjust the fruit to what you have or like. Hi Rachel, I’m so happy you are enjoying the salad and I love the swap of grapefruit and pineapple – yum! And you are so right, what a delicious breakfast! !